For other uses, see The Potter's Field (disambiguation). A potter's field, paupers' grave or common grave is a place for the burial of unknown or indigent people. "Potter's field" is of Biblical origin, referring to Akeldama (meaning field of blood in Aramaic), stated to have been purchased, with the coins that had been paid to Judas Iscariot for his identification of Jesus, after Judas' suicide, by the high priests of Jerusalem. The priests are stated to have acquired it for the burial of strangers, criminals, and the poor, the coins paid to Judas being considered blood money. Prior to Akeldama's use as a burial ground, it had been a site where potters collected its high-quality, deeply red clay for the production of ceramics, thus the name potters' field. Then Judas, who betrayed him, seeing that he was condemned, repenting himself, brought back the thirty pieces of silver to the chief priests and ancients, saying: "I have sinned in betraying innocent blood." But they said: "What is that to us? Look thou to it." And casting down the pieces of silver in the temple, he departed, and went and hanged himself with a halter. But the chief priests, having taken the pieces of silver, said: "It is not lawful to put them into the corbona, because it is the price of blood." And after they had consulted together, they bought with them the potter's field, to be a burying place for strangers. For this the field was called Haceldama, that is, the field of blood, even to this day. The site referred to in these verses is traditionally known as Akeldama, in the valley of Hinnom, which was a source of potters' clay. 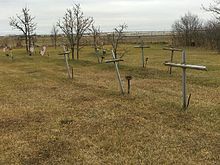 After the clay was removed, such a site would be left unusable for agriculture and thus might as well become a graveyard for those who could not be buried in an orthodox cemetery. This may be the origin of the name. A field where potters dug for clay would also be "conveniently already full of trenches and holes." Then what the prophet Jeremiah had said came true: "They took the thirty silver coins, the amount the people of Israel had agreed to pay for him, and used the money to buy the potter's field, as the Lord had commanded me." This is based on a quotation from Zechariah (Zechariah 11:12-13). However, Matthew attributes the quote to Jeremiah. The author of Matthew may have been mistaken. There are two other possible reasons for the reference. First, Jeremiah also speaks of buying a field, in Jeremiah 32:6-15. That field is a symbol of hope, not despair as mentioned in Matthew, and the price is 17 pieces of silver. The author of Matthew could have combined the words of Zechariah and Jeremiah, while only citing the "major" prophet. Secondly, "Jeremiah" was sometimes used to refer to the Books of the Prophets in toto as "The Law" is sometimes used to refer to Moses' five books – Genesis through Deuteronomy, the Pentateuch. Craig Blomberg suggests that the use of the blood money to buy a burial ground for foreigners in Matthew 27:7 may hint at the idea that "Jesus' death makes salvation possible for all the peoples of the world, including the Gentiles." Other scholars do not read the verse as referring to Gentiles, but rather to Jews who are not native to Jerusalem. William Blake used the term in Chapter 1 of Jerusalem The Emanation of the Giant Albion, "Jerusalem is our Harlot-Sister / Return'd with the Children of pollution, to defile our House, / With Sin and Shame. Cast! Cast her into the Potter's field." Lincoln Park, on Chicago's North Side, found its origin in the 1840s as Chicago City Cemetery. The southernmost portion of the cemetery, where one may now find a number of baseball fields (north of LaSalle Dr., west of North Avenue Beach), was the location of the City Cemetery potter's field from 1843 to 1871. More than 15,000 people, including 4,000 Confederate soldiers, were buried here on marshy land near the water's edge. The baseball fields have occupied these grounds since 1877. Madison Square Park, Washington Square Park and Bryant Park in New York City originated as potter's fields. 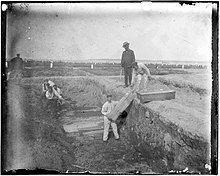 The city's current potter's field, and one of the largest cemeteries in the United States, with at least 800,000 burials, is on Hart Island. Queen Lane Apartments work on the project was delayed by the discovery of a Potter's Field on an adjacent plot. Washington Park (Albany) was the site of the State Street Burying Grounds, a municipal cemetery which included a Potter's Field. Some maps identify the section as the "Strangers" burial ground. Holt Cemetery in New Orleans contains the remains of known and unknown early jazz musicians, including Charles "Buddy" Bolden. The battered remains of Robert Charles, at the center of the 1900 New Orleans race riot were briefly interred there, then dug up and incinerated. It is located next to Delgado Community College. Toronto, Ontario had a Potter's Field at the corner of Yonge and Bloor Streets. The burial grounds were closed with some of the bodies moved to other cemeteries. Unknown number of bodies remained on the site when it was built over. Today the grounds are part of the posh Yorkville district, and the site of an office tower. Blue Plains, in the Anacostia area of Washington, D.C., contains remains of executed international spies including Nazi spies from Operation Pastorius. Music Hall in Cincinnati, Ohio was built over a nineteenth-century potter's field. Hart Island, New York, the Potter's Field in New York City, is featured in the film Don't Say a Word. The independent documentary Hart Island: An American Cemetery[permanent dead link] by Melinda Hunt also concerns Hart Island. It is now confirmed that the child actor Bobby Driscoll (Peter Pan, 1953) is buried in Potter's Field on Hart Island in New York, being unidentified at the time of his burial. This is also loosely referenced in Law & Order: Criminal Intent in the episode "Blasters". In the HBO drama Oz, "Potter's Field" is the name for the cemetery where deceased prisoners with no next-of-kin or whose remains are unclaimed are buried. In the 1953 film Pickup on South Street, the character Moe Williams' (Thelma Ritter) sole motivation for work is to save money in order to prevent a possible burial in Potter's Field. In Victor Hugo's Les Misérables, Jean Valjean is buried in Potter's Field. From Potter's Field is a novel by Patricia Cornwell. The Potter's Field is the name of the seventeenth chronicle in the series of Brother Cadfael detective books by Ellis Peters, later turned into a television episode. Potter's Field is the title of a 3 issue limited comic book series (plus a one shot) written by Mark Waid and published by Boom! Studios about an anonymous investigator who takes it upon himself to discover the identities of those buried on Hart Island. A potter's field is featured in Neil Gaiman's novel The Graveyard Book. One of the characters, Liza Hempstock, is a witch who was buried in a potter's field next to Nobody Owens' graveyard. Potter's Field is an album by the rock band 12 Stones. "No Eagle Lies in Potter's Field" is the name of a song by the rock band On A Pale Horse. "Potter's Field" is the name of a song by the American Thrash metal band Anthrax from their 1993 album Sound of White Noise. Railroad Earth has a song called "Potter's Field" on their self-titled 2010 album. "Potter's Field" is a song by alternative band Mono Inc.
Tom Waits makes references to Potter's Field in several of his songs. On the title track to Johnny Cash's album American IV: The Man Comes Around, the lyrics include a reference to "the potter's ground" as a metaphor for dying without salvation. In the long-running MUD GemStone IV, an area called the "Potter's Field" is the primary spawn area for zombies. The area's descriptions are, indeed, of a long-disused graveyard for the indigent and unknown. Similarly, in City of Villains a massive graveyard called "Potter's Field" is a place where zombies spawn, while magicians use the area for necromantic rituals. American bluegrass band Blue Highway mentions a Potter's field as Ottie's final resting place in the song "Clay and Ottie". The name of the American noise rock band A Place to Bury Strangers describes a potter's field. The Venture Compound in The Venture Brothers has a potter's field containing dead henchmen, as well as the bodies of a succession of clones Dr. Thaddeus Venture had made of his accident- and danger-prone sons. Hank and Dean Venture remembered their father telling them to avoid a spooky house on the edge of their property, "Mr. Potter's house". However the actual inhabitant, a reclusive scientist named Ben, told Dean Venture that no one named "Mr. Potter" had ever lived there, and theorized that Dean's father had actually called it "potter's field", because he and his father used the field in front of the house to bury the massive number of supervillains and henchmen who died on the compound over the decades, and hide the clone bodies to prevent others (including the Venture boys themselves) from learning that the original Hank and Dean were dead. The term was used by Saul Berenson in the Series Homeland Episode 7 to describe where Raqim Faisel would be buried. Over the Garden Wall features a town called Pottsfield, which is the residence of dead spirits. In the novella Prisoner 489 by Joe R. Lansdale, in the potter's field behind the prison the headstones are only marked with the number in the order the condemned were executed. In the film It's a Wonderful Life, Potter's Field is Henry F. Potter's housing development intended for those too poor to live in his slums. He eventually loses Potter's Field tenants to George Bailey's nicer, more affordable Bailey Park. Joanna Newsom makes reference to the term in the song Sapokanikan, from her album Divers. ’The Potter’s Field’ is the title of one of the episodes from the fifth TV series of Montalbano. In the tenth episode of the fifth season of Person of Interest, "When the World Went Away" the character Root makes reference to "the most principled corpse in Potter's Field." After her death, she is briefly interred in one (presumably Hart Island) before being disinterred in a search for her modified cochlear implant. The third act's climax of Gideon's Sword by Douglas Preston and Lincoln Child takes place on Hart Island. The book mentions the burial fields extensively. Preston has a blog post in their website about his own experience at Hart Island during a research trip. Potter's Field is the location where Mike "Meathead" Stivic suggests to his father in law Archie Bunker to bury his Cousin Oscar in an episode of All In The Family. In the 2017 film, Star Wars: The Last Jedi, the character Kylo Ren informs Rey that her parents are buried in paupers' graves in the middle of the desert of the planet of Jakku. In the 2017 musical, The View UpStairs, the character Patrick refers to being buried in a Potter's field after being killed in the arson attack on the UpStairs Lounge. ^ Dictionary.com. Collins English Dictionary - Complete & Unabridged 10th Edition. HarperCollins Publishers. http://dictionary.reference.com/browse/potters field (accessed: December 24, 2014). ^ Bahde, Thomas (30 December 2016). "The Common Dust of Potter's Field". 06 (04). Retrieved 30 December 2016 – via Common-Place. ^ Craig L. Blomberg, "Matthew," in Commentary on the New Testament Use of the Old Testament (Grand Rapids: Baker Academic, 2007), 97. ^ "Hidden Truths: Potter's Field". Retrieved 30 December 2016. ^ Risen, Clay. "Hart Island - The Morning News". Retrieved 30 December 2016. Wikimedia Commons has media related to Common graves.